The National Association for Information Destruction (NAID) recently announced that it had commissioned a study of 250 electronic devices resold in the secondhand market and 40% contained personally identifiable information. Personally identifiable information (PII), or sensitive personal information (SPI), as used in information and security laws, is information that can be used on its own or with other information to identify, contact or locate a single person, or identify an individual in context. Some of the PII that was recovered includes credit card information, contact information, usernames and passwords, company and personal data, tax details, etc. In the NAID report, PII was found on 44% of the hard drives. While mobile phones had less recoverable PII at 13 percent, tablets were found with the highest amount at 50 percent. AccuShred provides NAID-Certified hard drive destruction. The difference between the process of hard drive sanitation and hard drive destruction is one of certainty. One thing that no one argues is that it is virtually impossible to retrieve information from a hard drive that is physically destroyed. 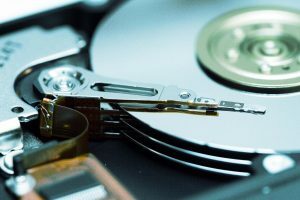 Even proponents of hard drive sanitation warn that there are several vulnerabilities in the process that could lead to “intact” information surviving the process.